Browser hijackers are one of the most prevailing nowadays. Thus, do not be surprised if your system is affected by WebSearchy.com. You will definitely notice its presence because your homepage will be changed to WebSearchy.com and your default search engine will be replaced by yahoo.com. Unfortunately, you will not be able to restore these changes so easily because Search Protector software, which prevents changing the homepage and search engine, will be installed on your system as well. Besides, the application might affect all major browsers. Thus, you should better read throughout the article in order to find out how to get rid of WebSearchy.com browser hijacker. The fact that WebSearchy.com might replace your homepage is not the only observation. It has been found out that you will not be able to search for the information effectively anymore because you might be offered to click on sponsored links. They might appear among decent search results and you might click on them without suspecting any dangers. It might be suggested that the risk of using this search engine is bigger than its advantages, for instance, multiple search services. In addition, you might experience different kinds of redirections as well because this program might modify DNS. As you might have probably understood, the removal of WebSearchy.com is the best solution. It is very probable that this application enters the system bundled with other additional applications because no official website was found. You should know that this program is not the only one. The publishers of undesirable programs usually use this tactic in order to distribute their creations. People often install undesirable programs without wanting that because they do not pay enough attention to the setup wizard. Besides, they just keep skipping the steps by clicking Next/Continue. One of the main advice for those that seek to protect their systems is to install programs carefully and download them from reliable sources only. In addition, do not forget to install a decent security tool. The removal of WebSearchy.com might help you to protect your system from different kinds of infections. It also means that you will be able to set your preferred homepage and search engine. 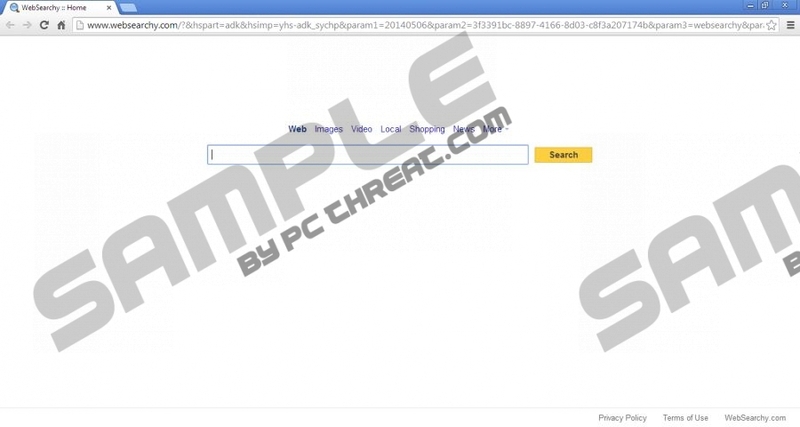 The manual removal instructions will help you to erase this browser hijacker from your system. However, if it happens that you experience any difficulties regarding the removal, you should definitely use an antimalware tool, for instance, SpyHunter. Such a tool will not only detect and remove different kinds of infections, but also protect your system from future threats. Click on the undesirable software. Enter Control Panel in the field and then click OK.
Click on the General tab, type in your homepage URL and click OK. Tap Alt+T again and then select Manage Add-ons. Click Search Providers from the menu on the left. Select a new search provider and then click Set as default. Click on the unwanted search provider and then click Remove. Tap Alt+T and then move to Options. Type in your homepage URL in the field near Home Page. Go to the start page of your browser. Click on the search field near the search provider icon. Tap F4 and select a new search engine. Tap F4 again and then click Manage Search Engines. Click on the search provider that you want to remove. Remove/enter URL and click OK. In the section Appearance, mark Show Home button. Click Change. Scroll down and select Manage search engines under Search. Select a reliable search engine and click Make default. Click on the unwanted search provider and then click X. Quick & tested solution for WebSearchy.com removal.